It looks like an Ugg ate a Wellie and is both pooping and puking it out. What do you think? OMG CUTE FOR THE TAILGATE or Ugg puking and pooping out a Wellie? 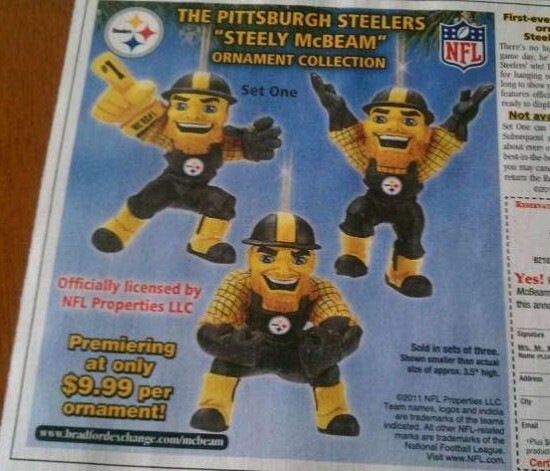 While we’re talking about Steelers merchandise, here’s a picture I snapped from a coupon circular and threw onto Twitter a few weeks ago, and then forgot to share it here with you! Also, pretty sure that bottom ornament is pooping in your tree. Good Lord. Cute? You betcha. Oh your talking about clothes. BTW, did anyone mention PHG was planned and it worked like a charm. I saw this yesterday while cutting coupons. I immediately thought of you. I think Steely McBeam poops out coke which explains his rather rough looks. They belong in a creepy closet somewhere with those creepy dolls you posted about before. Also – those boots are just ugly. Really. 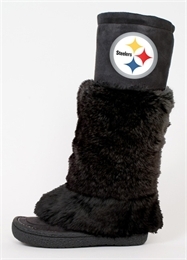 I feel like if Snooki was a Steelers fan, she would wear those boots everywhere. OK, so the score reads: men like the boots because of the smokin’ models in the picture, women not so much. Probably for the same reason. At least Steely isn’t wearing them. I like the retro Mercury Men, thanks for the head’s up. I think the Steely McBeam ornament is wearing the Steeler boots! Oh, those boots are just hideous. And so are the ornaments for that matter. Those are going to haunt my nightmares. @ Katie – That’s Church! stupidly innefective in snow boots with pants tucked into them are the devil. and ugly. Definitely puking Uggs. So Snooki-ish. Bleah.